When looking up at the stars at night have you ever wondered if there is other life out there? When a person realizes how many galaxies and stars are out there in the incomprehensibly large Universe, it is only logical to ask, "Is there intelligent life out there?" The Search for Extraterrestrial Intelligence Institute (SETI Institute), started about half a century ago with the quest to find life in the Universe. The key question is what to look for in order to detect extraterrestrial intelligence. How many technological civilizations are in out there in Space? Scientists do not yet have precise values for each factor, but are working to obtain more accurate information. For example, astronomers recently found that smaller and cooler stars might be capable of supporting life on an orbiting planet. Also, recent discoveries of Extrasolar planets, showed that planetary systems around the stars might be something quite common. Based on our own human advancements, scientists believe radio signals are probably the most common and easy to detect sign of a technologically advanced civilization. Using large radio telescopes, astronomers have the ability to detect such signals. Astronomers could even detect unintentional signals sent as a form of internal communication, such as our radio or television. Similar technology from extraterrestrials would emit waves or signals that travel through the space. Astronomers started to "listen" to nearby stars for radio signals about 50 years ago. Phoenix, an ambitious project used some of the world largest radio telescopes in Australia, West Virginia and Puerto Rico to "listen" to 800 nearby sun-like stars. The technology was so sensitive that it would be able to register radio signals as strong as the signals sent by Earth's military radar. The immediate data processing also allowed elimination of all signals originating on Earth. The fact that astronomers failed to register signals, may simply mean that they did not listen to the right "radio station" at right time. Searching for optical signals is a relatively young field in the search of Extraterrestrial Intelligence. Powerful lasers which emit very strong and focused optical signals could be detected from space. Astronomers at Harvard University have been conducting regular observations in search of such optical signals. The Planetary Society also surveys the sky for optical extraterrestrial signals using a powerful 72 inch telescope. The OSETI is quite promising because the highly focused laser beam is few times brighter than the Sun and could be used to transmit large amounts of data. Broadcasting or sending decipherable messages to the other solar systems currently seems like a castaway sending a message in the bottle hoping someone will find the bottle in the vast ocean. However, with the enormous advancement in technology, we are approaching greater and greater capabilities. Actually, astronomers sent a message in 1974 to the globular cluster M13 which contains about million stars. The message contains coded signals. One of the major obstacles is the distance. For example the M13 stars are about 13,000 ly way of the Earth. It means that if somebody does respond to our message, we won't receive the answer until 26,000 years later and by then our civilization will probably be gone. Pioneer 10 and 11 spacecraft have information for alien civilizations about Earth. 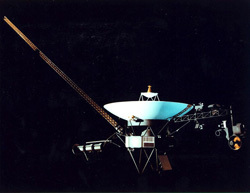 Voyager 1 and 2 even carry a record of the Earth and major achievements of the human civilization. These spacecrafts are all currently headed out of the Solar System and some alien civilization may eventually discover the information and respond. We really have no way of knowing how advanced such alien civilizations could be. They could be so advanced that they could have already found ways of surpassing what scientists deem the laws of physics. Perhaps, they have found ways to travel much faster than the speed of light. WOW! A very strong radio signal was registered in 1977 by the astronomer Jerry R. Ehman during his work for SETI at the Big Ear radio observatory. Unfortunately, when scientists looked again at the same place in the sky they did not detect the signal. It may have been an earth signal or an error. When astronomers plan similar searches, they try to secure a second telescope, which is independently able to confirm the observation eliminating potential errors and confusion. SETI@home is the largest multi-computer project dedicated to the search for Extraterrestrial Intelligence. More then 3 million users from all over the world are connected to the main server and help to process the radio telescopic data. You are welcome to join the project. The only thing that you have to do is to download the screen saver and free software. Then when your computer is idle, it actually will work to process radio signals and who knows you might be the one that will find an intelligent extraterrestrial signal. For more details go to SETI@home. American astronomer and astrophysicist and a pioneer in the search for extraterrestrial intelligence. He is also one of the founders of the SETI Institute. The galaxy to which the Solar System belongs. It is a barred spiral galaxy and home to 200-400 billion stars. The optical search for extra-terrestrial intelligence, which attempts to detect pulsed laser signals as sent by other civilizations. A very dense grouping of stars existing inside or next to a galaxy, containing anywhere from 100,000 to 1 million stars. Also known as Messier 13, it is a globular cluster found in the constellation of Hercules and consisting of about 300,000 stars. It was discovered by Edmund Halley in 1714. In 1974, the Arecibo Message, written by Frank Drake and Carl Sagan, was broadcast from the Arecibo radio telescope in Puerto Rico. A unit of measure, it is the distance that light travels in one year. It is equivalent to aproximately 5.879 trillion miles. The speed at which light travels in a vacuum, or 186,000 miles per second. The distance that light travels (in a vacuum) in one year. Equivalent to about 9.5 trillion kilometers, or about 6 trillion miles. Begun in 1995, Project Phoenix was the world's most sensitive and comprehensive search for extraterrestrial intelligence. It was an effort to detect extraterrestrial civilizations by listening for radio signals that were either being deliberately beamed our way, or were inadvertently transmitted from another planet. Phoenix was the successor to the ambitious NASA SETI program that was cancelled by a budget-conscious Congress in 1993, and it ceased operations in 2004, after plans for the Allen Telescope Array where unveiled.